MSc in International Development and Humanitarian Emergencies students: Marina Sbaity, Veronika Filipkova, Alexander Wipfler, and Minan Muhammad-Ahmed, tell us about their recent trip to the Humanitarian Networks and Partnerships Week in Geneva, where they presented their initial findings on the Humanitarian-Peacebuilding Nexus and decision-making based on effective conflict analysis. As prospective LSE students, the International Development Consultancy Project was one of the most exciting things to look forward to in the coming year. Our team, Marina Sbaity, Veronika Filipkova, Alexander Wipfler, and Minan Muhammad-Ahmed, spent the year working on a particularly exciting project with the UN Office for the Coordination of Humanitarian Affairs: The Humanitarian-Peacebuilding Nexus: decision-making based on effective conflict analysis. How are decisions made, how do they affect emergency response, how to bridge the gap between humanitarianism and making peace – all of those were questions we have been attempting to answer throughout the year. 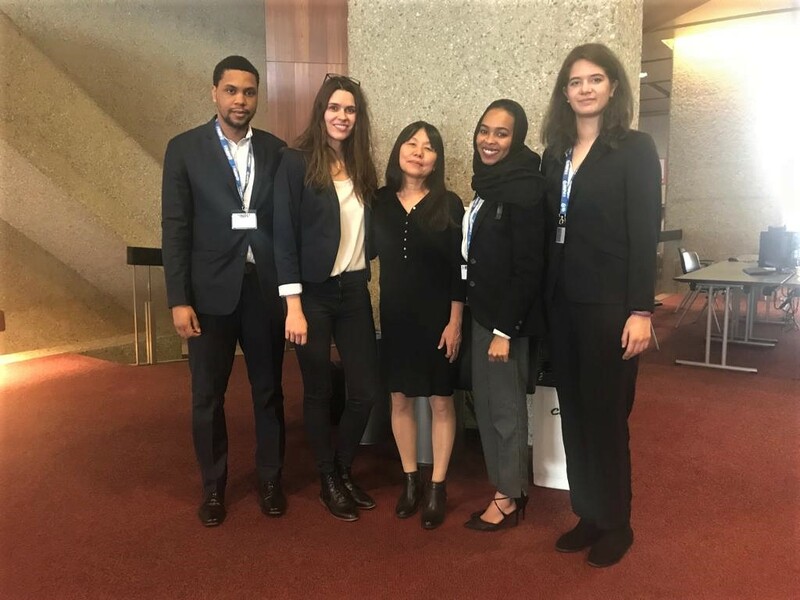 The culmination of months of rigorous research was in early February, when we were invited to present our initial findings in the Humanitarian Networks and Partnerships Week in Geneva, Switzerland. Co-chaired by OCHA and the Swiss Agency for Development and Cooperation (SDC), it provided a unique platform for discussion on key issues in the humanitarian sphere; the humanitarian-peacebuilding nexus being one of the most prominent topics to be debated. It is also the flagship event for the Leading Edge Programme which is aiming to improve disaster response by opening the space for dialogue between the different actors involved in humanitarian response. All throughout the conference, the Conflict Analysis Network had numerous discussions on existing obstacles to bridging the gap between the decision-makers and the analysts, attesting to the importance of improved coordination for a more efficient response. As OCHA consultants, we were given the space to present the findings of our project as well. Our presentation was based on both secondary data review and interviews that we have been conducting with humanitarian aid workers at the strategic and operational level. From our research, we presented on key internal and external constraints to efficient decision-making, such as a range of structural, psychological, and organisational factors. We also spoke about specific case studies (Syria and South Sudan), which were particularly relevant as several the conference attendees was based in those two countries. We were also able to share a fresh insight into the nexus with the attendees, putting into words the tension that some had been experiencing with linking humanitarian principles such as neutrality with peacebuilding – a historically political activity. Presenting at the HNPW week was one of the highlights of the year for all us. Letting go of the student life essentials such as spending hours in the library and immersing ourselves into the professional world of humanitarian decision-makers – and even more so, contributing to a conference of this level has taught us more than we could have possibly expected. Knowing that our findings contributed to improving humanitarian response, and hopefully, making someone’s life a little bit better is the pinnacle of our hopes as current – and future – humanitarians. Marina is interested in the intersection between humanitarian assistance, gender equality, and development. She interned with the OCHA Analysis Unit in Beirut, Lebanon and subsequently worked for the Information, Counselling and Legal Assistance programme in the Norwegian Refugee Council. She is currently pursuing an MSc in International Development and Humanitarian Emergencies. Veronika comes from a background in finance and international development. She recently returned from Uganda where she worked as Programme Manager for a UK organisation building schools, hospitals and WASH facilities. She has a three-year experience working in finance for the European Investment Fund in Bratislava and delivering projects in less developed regions. Veronika is currently doing her MSc in International Development and Humanitarian Emergencies at LSE. Minan Yousif Ahmed is a lawyer engaged in social activism with a focus on child rights in Sudan. She has been working and volunteering with local NGOS and UN Agencies such as UNDP. Minan is currently a postgraduate student at the LSE undertaking an MSc in International Development and Humanitarian Emergencies. Alexander Wipfler is currently a masters student at the London School of Economics studying International Development and Humanitarian Emergencies. After graduation from the University of Reading with a degree in Economics, he moved to South Sudan to run several private businesses. Prior to joining the masters program at LSE he spent a year serving as a peacekeeper with Kosovo Force (MNBGW). The views expressed in this post are those of the author and in no way reflect those of the International Development LSE blog or the London School of Economics and Political Science.